One area of our yard that has been our pride and joy for some time is located on the east side of our home. 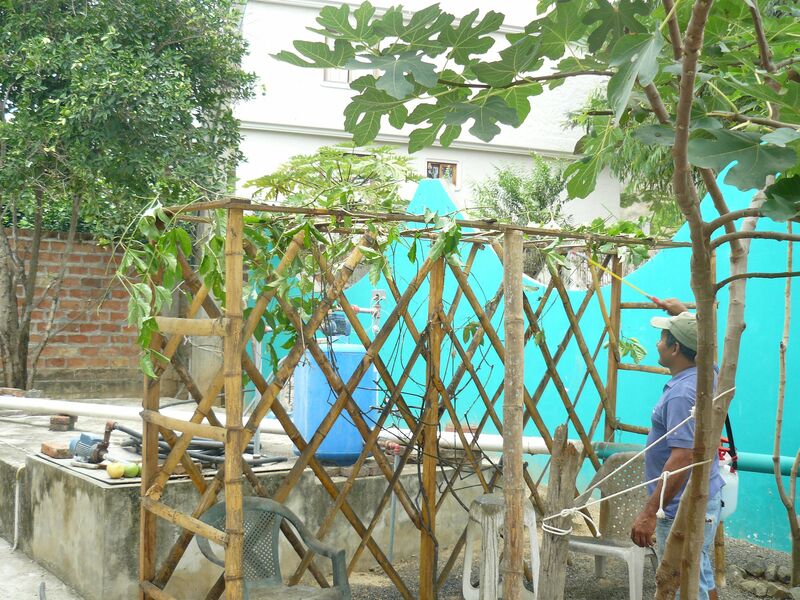 We built a trellis/arbor of bamboo in front of the water pump area and planted maracuyá (passion fruit) and uva (grape) vines in the hope that they would grow and cover that trellis and provide a nice shady area to sit under in the afternoons. 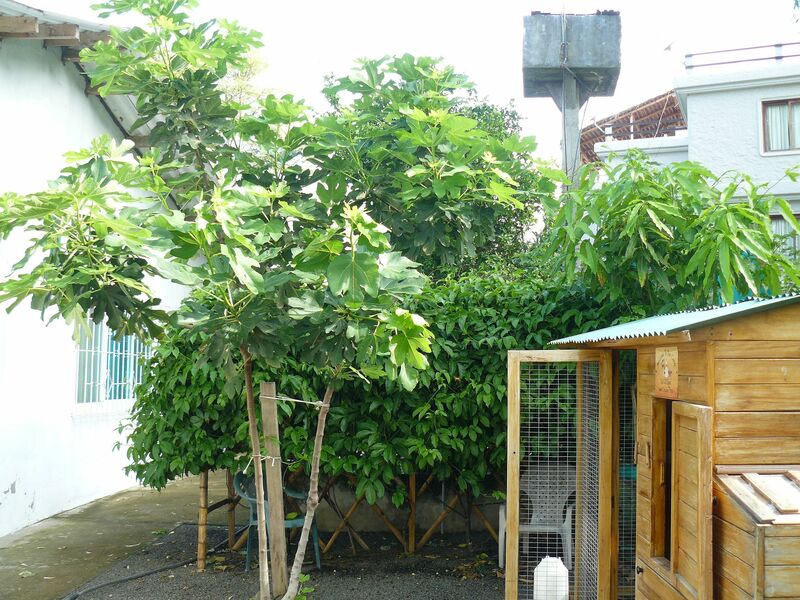 The picture above shows just how well the passion fruit vines grew. This picture was taken in March and shows the vines growing up and over the arbor area so that one had to duck under the canopy to get to the chairs. 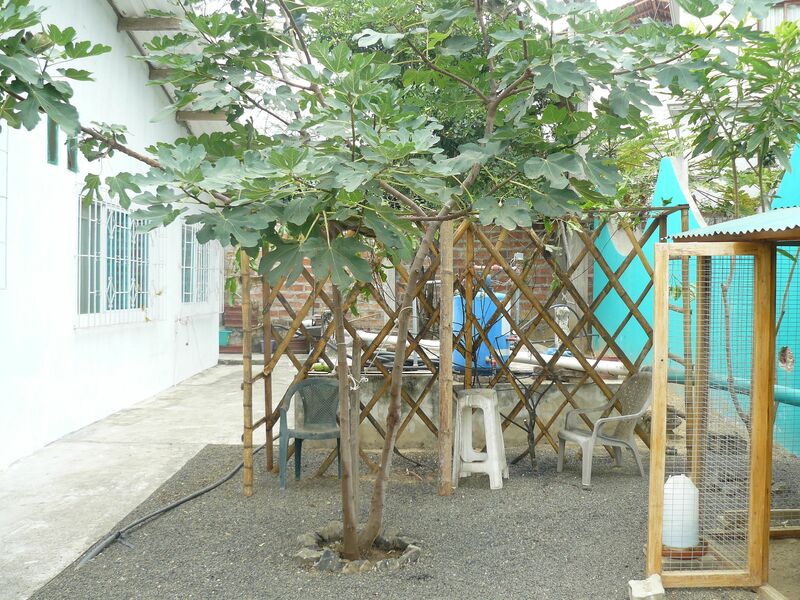 We already had to move the two grape plants out to another trellis as the passion fruit had outgrown the grapes and were effectively blocking all the sunlight from the grapes. In January of this year we determined to hold back on pruning the passion fruit until after the plant had produced flowers and fruit. Instead we turned the vines back onto the top of the arbor and allowed them to grow. For the last couple of months our gardener, Leon has been trying to trim the overhanging vines back and cutting off vines that were extending out and onto the fig and mango trees. During that time we regularly harvested passion fruit. But, in the meantime, the fast growing vines were killing off the vines underneath the mass and were also providing a refuge and feeding area for scores of bats who were, in turn, excreting waste on the chairs and small table under the arbor. Inasmuch as the vines have stopped flowering we decided that it was time to prune the vines back and provide fresh area for new growth. Enter Leon! 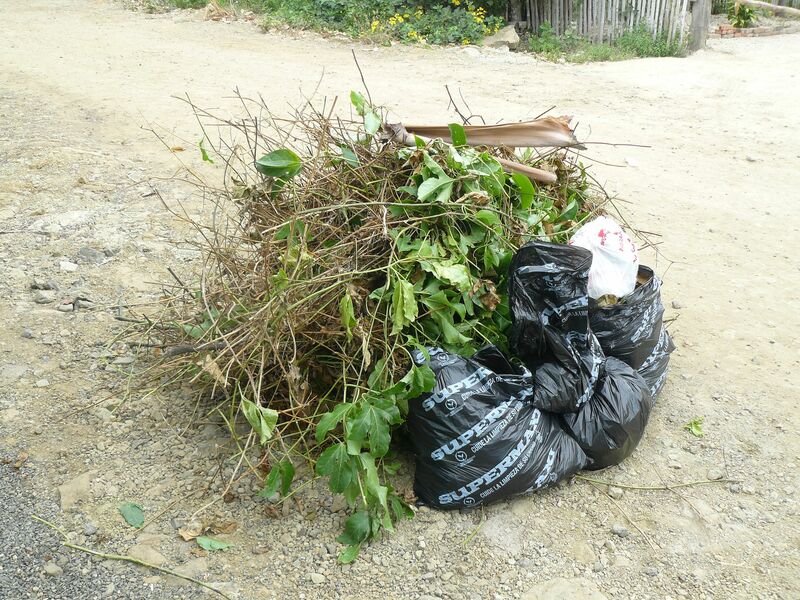 After an hour or so of work he had amassed quite a pile of cut vines in front of our house for garbage pickup. And the trellis laid bare exposing the water tank and pump. We knew this would happen, but even knowing how fast things grow here, it is somewhat shocking to see the change! 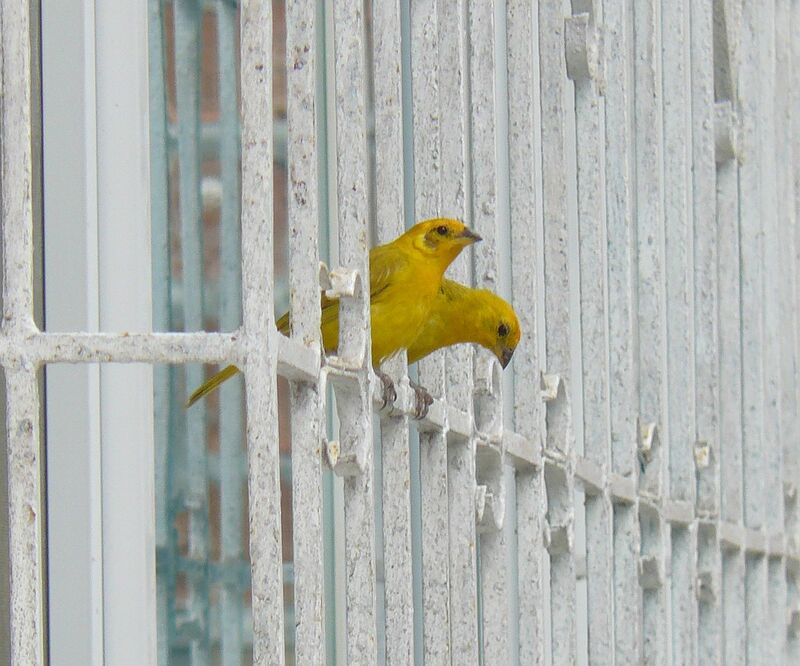 A couple of saffron finches looked on from the window grates wondering what Leon was up to! Leon assured us that within two months the area will be filled with fresh healthy green leaves and in December or January should start flowering and producing fruit. Leon cleaned up the area and applied fresh fertilizer and insecticide to encourage new growth. For now remember this next picture taken July 3rd, 2018. Your yard is beautifully taken care of! Love hearing from you! Love it! And we love hearing from you, JoAnn. Hope all is well in Northern Ohio! Lovely shot of those beautiful finches. Oh, Thank you. 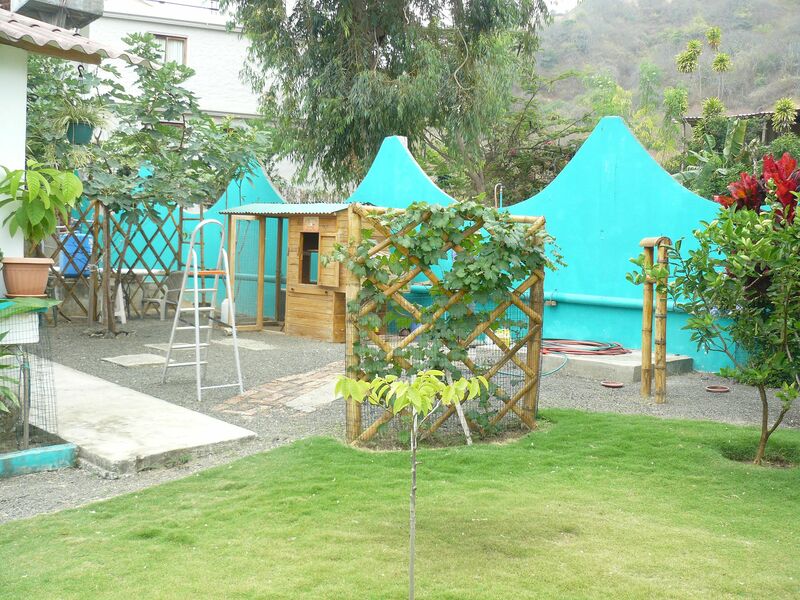 We are so blessed with our location – two short blocks up from the beach and nestled up near a small mountain or hillside allows us to have a greater range of plant life and that, in turn, attracts a wide variety of birds to our yard. I was telling a friend in the United States that we feel a bit like we have changed roles when we sit on our screened porch – somewhat like we are the ones in cages while, finches, parrotlets, doves, mocking birds, caciques, pigmy and burrowing ground owls, frigates, pelicans, herons, and a host of other avian visitors stride or soar past us. We live in a big bird house and butterfly sanctuary. Life is good! Hahaha. I can feel that way sometimes when you look around and realise just how much of nature is looking at you! But your location does sound divine. A heavenly mix! You are too right! I especially love the early mornings and evenings as Mary and I sit on one of our porches and watch nature either wake up or prepare for sleep. What a blessing it is to be retired and have the time to glory in the world around us! God is good.